Our St. Francis Xavier family would like to congratulate Michael Cancienne for making the 2018 LMEA All-State Band! Michael was selected through an adution process with the Louisiana Music Educators Association. This is such an honor and congratulations! Cabrini High School has share exciting news about two former students. The College Board has designated Amanda Sisung and Kathleen Tullis as Advanced Placement Scholars through this school year. Congratulation girls! We are so proud of Laura Youngblood who received Dominican&apos;s Valedictory Award for receiving the highest cumulative grade point average. Laura was also selected to receive Dominican&apos;s most prestigious Veritas Award, in recognition of her outstanding accomplishments in prayer, study, community, and service. Congratulations Laura and best of luck at the University of North Carolina at Chapel Hill! Brother Martin Sophomore, Hayden Courregé is featured in The New Orleans Advocate for leading the Brother Martin Cross Country team to a strong start this season, where he finished top in the Christian Brothers Invitational. Courregé ran a 3-mile time of 15 minutes, 35 seconds. The performance helped the Crusaders finish in second place. Congratulations, Hayden! St. Francis Xavier would like to congratulate De La Salle&apos;s salutatorian Marisa P. Thomassie! Marisa graduated with a 4.67 GPA and will be attending Northeastern University in Boston to major in international affairs. We are so proud of you! We would also like to congratulate Dane Williams. Dane received Brother Martin&apos;s Crimson Shield for "Displaying Exemplary Character." We are so proud of your outstanding achievement! Two of our former students that are presently attending St. Mary&apos;s Dominican High School have been awarded scholarships. Caroline Troendle was awarded the Drs. Jewell and Richard Wunderlich Scholarship for academic excellence. Also, Halle Briede was awarded the Sr. M. Hildegarde, O.P. band Scholarship. Congratulations! 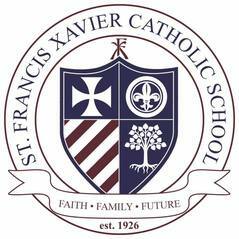 St. Francis Xavier is very proud of you!